If you're going to stop and smell the roses, you could do a lot worse than hitting the annual Rose Competition at the Parc de Bagatelle, on the outskirts of Paris. When I say outskirts, I mean right at the western edge of the Bois de Boulogne, not far from La Défense, which seems around the last place in Paris you'd want to go for nature, and flowers. Yet here you'll find competitors from around the world, all of them -- ideally -- in full bloom. There are a few sad plants that can't be judged, or appreciated, because they just don't cooperate. But the rest are pretty spectacular. Besides the look and the smell, I love the names of them. This beautiful bunch is named after Marie Curie, a woman who is now near and dear to my heart (or, more specifically, my breast). Breast cancer awareness month here, as advertised on the Institut Curie when I went there for diagnosis and treatment, is even called "Octobre Rose", though in all fairness "rose" in French means both the name of the flower and the general word for the color pink. This one is for Gigi, lover of King Louis XV history that she is, named after the King's lover, the Comtesse du Barry. Many other famous figures important to the history of France are represented. Leonardo da Vinci: he imagined so many things, but did he ever imagine a rose bush-tree thingy named in his honor? This flower below is aptly named the Paparazzi, since I really cannot help taking photos of it. This year's Grand Prize winners are the Lady of Shalott, named after a Tennyson poem, in the "countryside" category, and Cherry Bonica, in the category of "bushes of grouped flowers." The girls and I take some time to stop and smell the roses, quite literally, to help judge the public prizes in fragrance, as well as to find our favorites. Frankly, it's about the only way I can motivate the kids to get up off the lawn. Living in Paris, we really appreciate the times we get to picnic, lie on, play on, and walk on the grass. We're stopping to smell the roses, and the cut lawn, too, frankly. And to take a moment to admire the peacocks roaming around the garden.. The entire garden is a prize-winner, and that's not just me talking. The World Federation of Rose Societies agrees. The roses run the gamut from classic red roses to almost every hue of yellow, orange, and pink imaginable, in a wide variety of shapes. Oh, if only Smell-o-vision had already been invented, you would have your nose mashed up against your computer screen right now. The aroma in the garden on a warm, sunny day is intoxicating and heavenly. The rose garden is just one small part of the larger park, which is in turn the grounds for the Bagatelle mansion (you know, as in, "What? This little ole' house? Why, it's a mere bagatelle." And no, the word does not come from this mansion. It's the other way around. It was, literally, a mere bagatelle to the Count d'Artois, younger brother to Louix XVI, who had the house and gardens built in just 64 days in order to win a bet against Marie Antoinette). And this little thing? Why, it's just the garden shed. Just outside it, you can, of course, buy your own gorgeous rose bushes to bring home and plant (and if you do, by the way, I just learned that planting banana peels in the dirt around your bush will help fertilize it). All we city dwellers can do is fantasize. Passing through it on our way out, we are offered rose....everything. Rose candy, soap, lotion, essential oils, nougat, caramels, and jellies, just to name a few. There's also a perfume school stand where they're not trying to sell us anything, miraculously. They're trying to teach and test us, and it turns out that of the four of us in the family, Gigi has -- by far -- the best nose. She can identify a dozen different perfumes minutes after they are introduced to her, and successfully passes the tricky which-one-is-different blind round. The rest of cannot tell you which one is different, nor can we remember which perfume smelled like what, though I'm pretty sure that I photograph the Serge Lutens bottle to try to remember that that is my favorite one. You know, in case I ever want to smell like a rose. 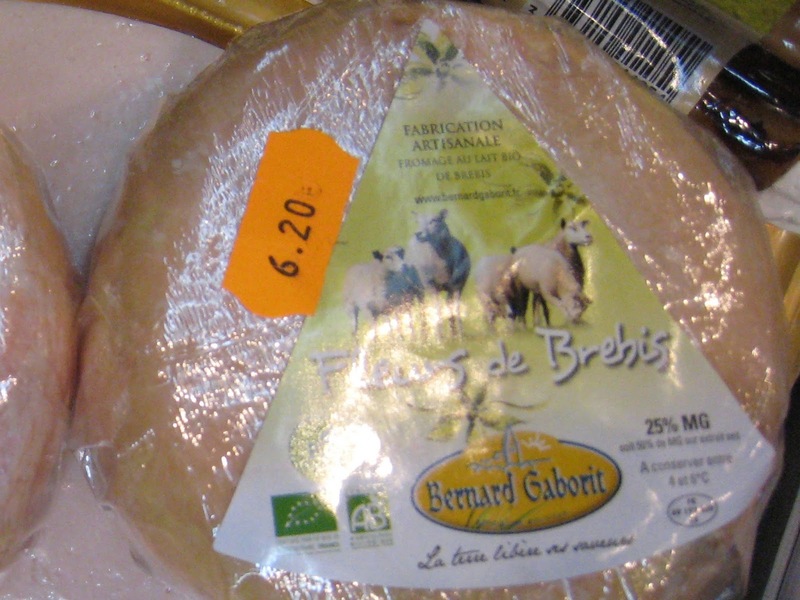 Fleurs de Brebis, which literally translates to "Flowers of Sheep", is not actually made with flowers, unless you count the ones the sheep eat before they are milked. This artisanal, organic, semi-soft cheese from Sèvres is made by Bernard Gaborit, the same producers as Fleurs d'Anjou. They like their flowers, evidently. It's a related cheese, very similar but made with pasteurized sheeps' milk instead of cow. The skin has that same sticky, stinky quality -- a light peach-orange and the smell of sandals after a hot day. Yes, it's still edible, and the inside is creamy with just a slight rubbery chew. The taste is a rancid-sweet that I've come to associate with so many orange cheeses. It's not entirely unpleasant (the "sweet") but it's definitely got some element that reminds you that cheese is, essentially, milk gone bad. This cheese, the Fleurs de Brebis, certainly does not smell like a rose, though it is a rather beautiful golden peach color. But here the connection is all about the name: "fleurs", meaning flowers, for a story about some pretty spectacular roses. This was a great read thank you for sharing, Steve from Idaho in North America.